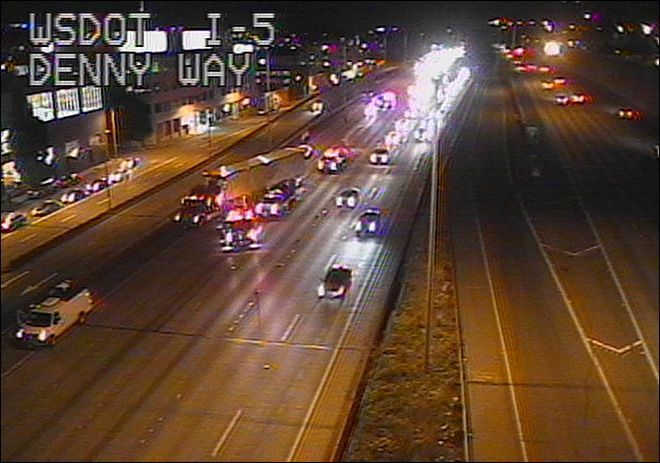 A suspected drunk driver caused several crashes on southbound I-5, which included setting one car on fire. The crash blocked three southbound lanes of I-5 and caused a traffic backup for several miles around 9 p.m. The thirty-eight year old driver struck a Toyota in his green Ford near Northgate, but did not stop there. The driver of the Ford kept driving southbound and then collided with other cars until his final impact with a semi-truck and a Honda near the Denny Way exit. This collision set the Honda on fire and the driver was taken to Harborview to be treated for her injuries. The semi-truck driver, Rob Funk, saved the drivers from burning alive by pulling a fire extinguisher out of his truck. Funk emptied his extinguisher and another truck driving passing handed him bigger fire extinguisher out of the window. Funk used the extinguisher and got the fire to stop. The driver, who was driving on a suspended license, was arrested for investigation of a DUI and then taken by ambulance to Harborview Medical Center for treatment of injuries. After his care at the hospital, he will be booked in King County Jail. Reports say that the suspect threw a beer can out the window at one point, striking the vehicles and barrier.